Growing your own lemons is easy if you live in California or Florida, but for most Americans the climate means it isn’t an option. Or does it? In fact if you know what you’re doing it’s possible to grow a lemon tree indoors, and there are a lot of benefits in doing that. A small tree is an attractive addition to your home. It adds a touch of natural freshness with its subtle aroma. And of course, if you treat it properly, it will deliver regular crops of juicy lemons. If you’re thinking about growing an indoor lemon tree there’s some good news; it’s much easier than raising other citrus varieties indoors. You can grow an orange tree without too many problems but your odds of getting edible fruit from it aren’t high. Lemons are much more achievable, so if you like the idea of being self-sufficient in citrus you know what to do. The first step is to choose a suitable lemon tree. There are a lot of varieties and some cope with indoor living better than others. The Meyer variety is the top choice. Its fruit tends to be small, but boldly flavored and ideal for cooking or slicing into your drink. They’re sweeter than most store-bought lemons, too. If you want something slightly more exotic-looking, but still easy to grow, variegated Eureka lemons have interesting pink flesh and again great flavor. Choosing the ideal place for an indoor tree is easier than an outdoor one, because if you get it wrong you can move it easily. It’s still worth picking a spot in advance though. 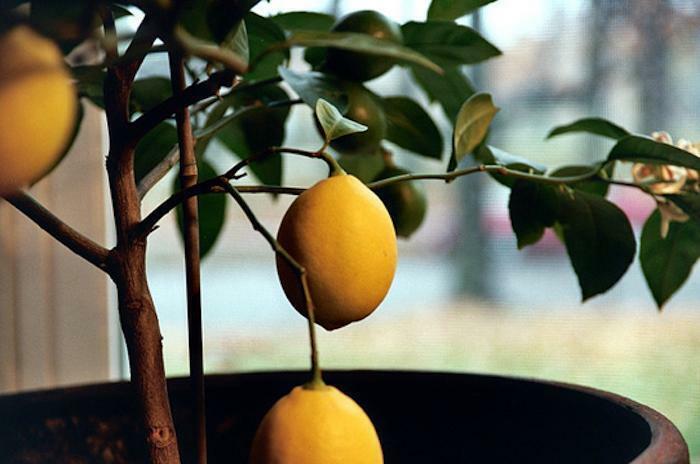 For a lemon tree to thrive it needs sunlight, as much as possible and a minimum of six to eight hours a day. A south-facing window is the obvious location but anywhere that catches the sun will do. If you have a sunroom that’s obviously ideal. Your tree will need a good-size container if it’s going to have the vitality to produce fruit. A ten gallon pot should be adequate – fifteen is even better. These will support a tree up to around eight feet high, which is a good size for a dwarf Meyer tree. Stand the pot in a tray or saucer with some gravel scattered in it, to create an air gap beneath the pot. Lay a piece of cloth inside the base of the pot to prevent soil trickling out when you water it, and put another layer of gravel on top of that. The gravel is essential, because it will give enough drainage to prevent root rot. Half-fill the pot with potting soil and pack it down well – you want a good firm base. Now you’re ready for the tree. It’s possible to grow your own tree from a seed, but the fruit you get will often be disappointing. It can also take a while for any to appear, so you’re much better buying a two to three year old tree from a nursery. They’re very affordable; you can usually get one delivered for under $25, or save even more by picking it up yourself. Unwrap the tree’s root ball and check to make sure it hasn’t become pot bound. Separate or cut away any encircling roots and shake the ball gently to help it separate, then place it in the center of the pot. It helps if someone can hold it upright for you as you start to backfill around it. Again pack the soil down well, pressing out any trapped air. Once the pot’s full water the tree right away. Keep pouring until water starts to run into the saucer. That’s your tree established; now you just have to look after it. Lemon trees like humidity, generally a lot more of it than you’ll find in your home. You can simulate it by lightly misting the tree every day, but it’s going to need watering as well. Check the top layer of soil regularly and when the top two inches is fairly dry it’s time for water. Again add enough for the excess to drain out. Don’t let the saucer fill up, or standing water will collect inside the pot, but a small amount in there will help raise humidity around the tree. Lemons are subtropical fruit and like some warmth, so aim to keep the room it lives it at around 70°F during the day and 55°F at night. If it falls below this the tree will go dormant and stop growing until it warms up again. It will also benefit from regular feeding with a balanced fertilizer – lemons like a lot of nitrogen, so don’t stint on that. Left to its own devices your lemon tree will be decorative, especially when the delicate white flowers appear, but if you want fruit you’re going to have to help it along. When it flowers get a small paintbrush and look inside a flower – do this in the morning, while it’s cooler, to avoid heat damage to the delicate pollen. You should see five antlers in there, each dusted with yellow pollen. Use the brush to pick some up, then rub it on the central pistil – this has a lobed tip and is easy to tell apart from the antlers. That’s it – the flower is fertilized and should grow into a lemon. When the lemons appear they’re small and grow in clusters, and you need to thin them out heavily to let the remainder grow. Aim to remove about two-thirds of the fruit. The rest will take about seven to ten months to ripen depending on how much sun they get and the exact variety. And that’s it! Once it’s delivered its first crop your tree will keep on giving you fresh, home-grown lemons once a year. Basically, as long as you give your lemon tree some basic care and attention it should be a trouble-free experience. Disease and pests are rare with indoor plants; if you do get an insect infestation it’s usually a minor one that can be cleared up with insecticidal soap. Planting a lemon tree is a great way to grow your own fruit even in an apartment, and there are few things as satisfying as eating your own produce.